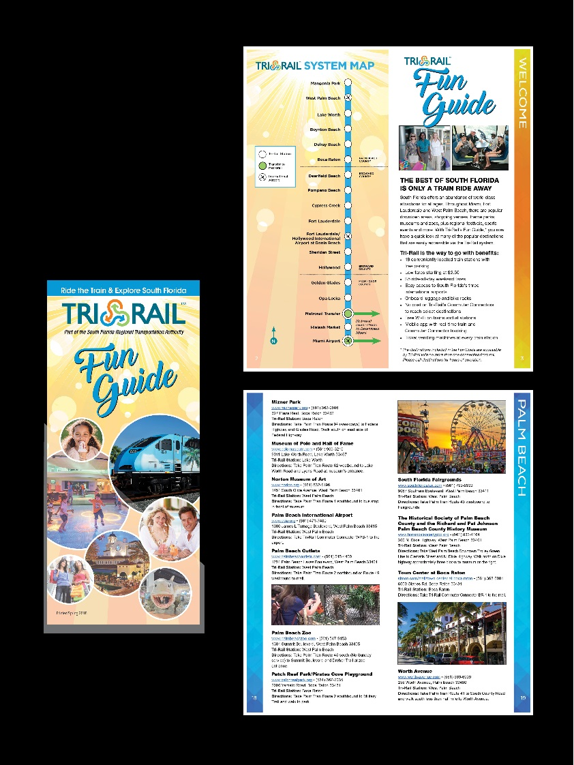 From Palm Beach to Miami, the Fun Guide provides destination recommendations with easy-to-use directions using Tri-Rail to connect to South Florida's many popular attractions. 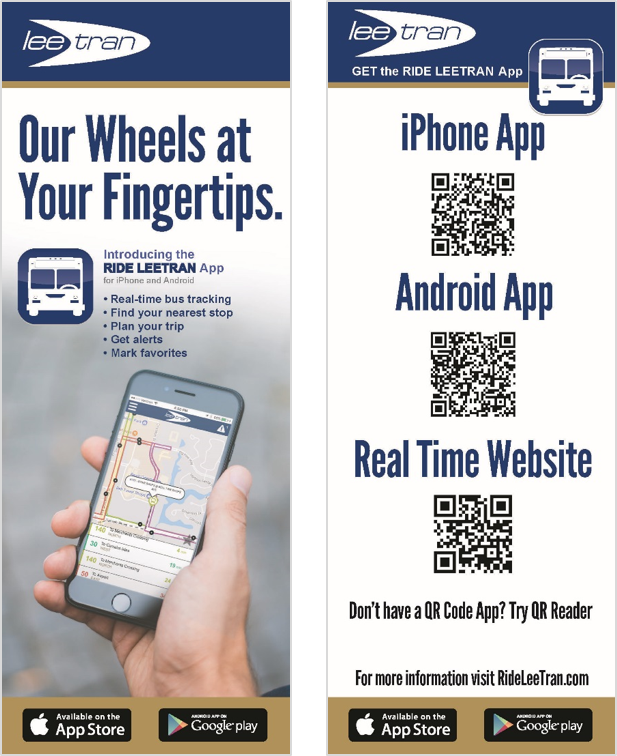 The “Our Wheels at Your Finger Tips” rack card is an element in a campaign to promote LeeTran’s real-time mobile phone application. Over 3,000 cards were distributed to passengers, at public outreach events and the app has been downloaded over 16,400 times. There is an ongoing need to promote Tri-Rail as an easy, inexpensive way to get to South Florida’s three international airports. 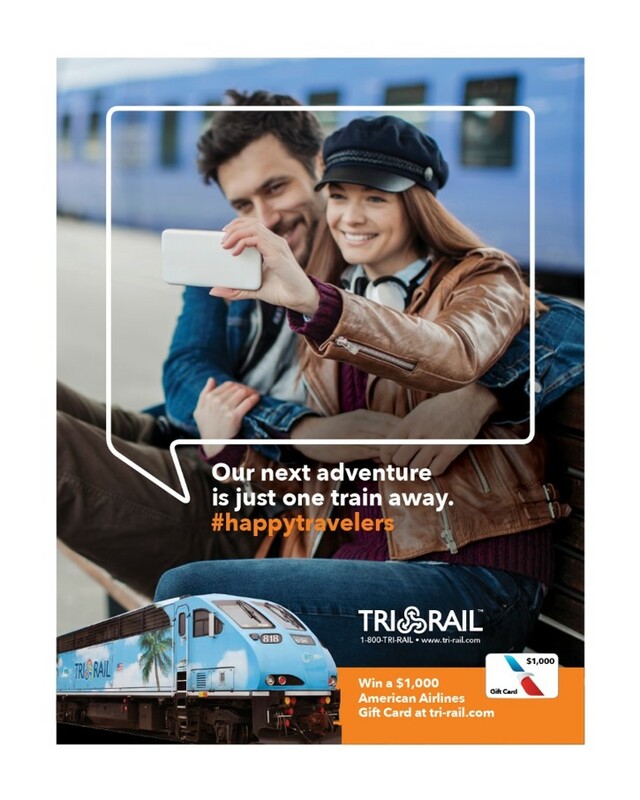 The #HappyTravelers airport ad was effective in reaching area residents and visitors who benefit from riding Tri-Rail to the airport. This direct mail piece was sent to the residents of Melody Lane and areas surrounding Noah's Landing inviting them to our board meeting to voice their concerns. The result was increased ridership, improved community relations and service to the citizens who truly need it most. 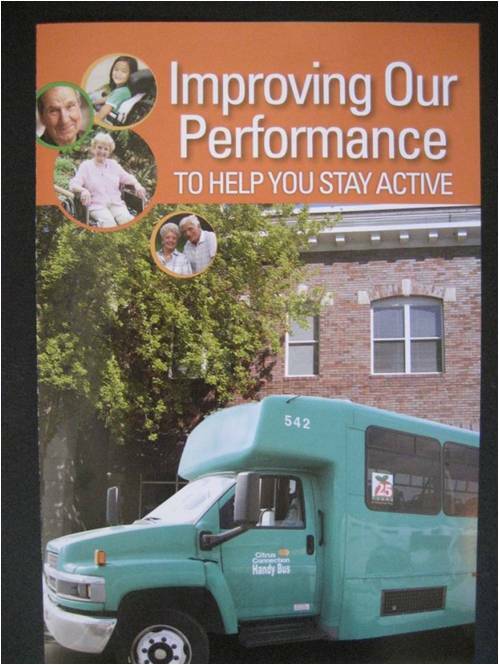 Indian River Transit used a well-designed comprehensive, yet simple guide to outline the services provided by the Senior Resource Association that features irts GoLine Public Transportation System and the Community Coach Door-to-Door Service. “Momentum” is the JTA’s new magazine created to inform stakeholders and decision-makers about how the JTA is advancing public transportation in Northeast Florida. The glossy publication features news and information about current, recently completed and future JTA projects and initiatives. 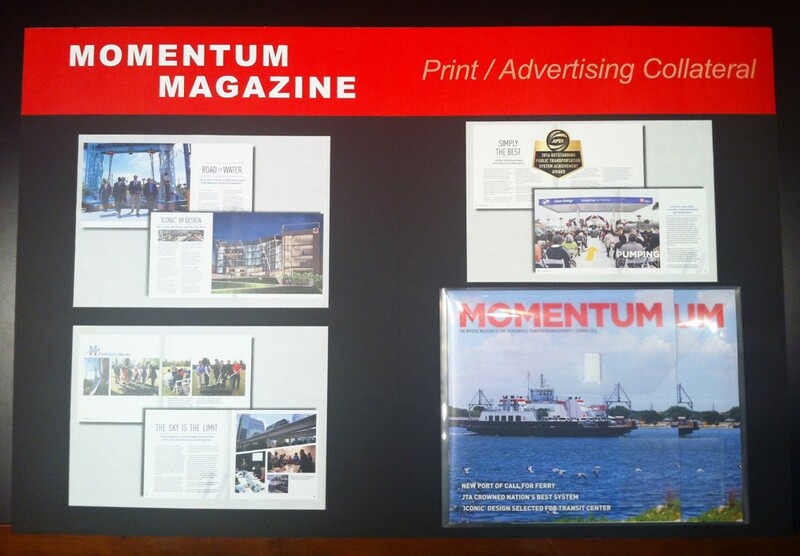 Momentum is 100 percent written, edited, designed and printed in-house. StarMetro wanted to engage riders in the #StarMetroTracker campaign, which highlighted the system’s new bus-tracker app. A dynamic flyer that showcased the technology was designed to push people to the campaign landing page, resulting in over 750 online signups for the #StarMetroTracker campaign initiative. After 4 years of being closed for construction, Tri-Rail’s Miami Airport station reopened with great fanfare and increased ridership. 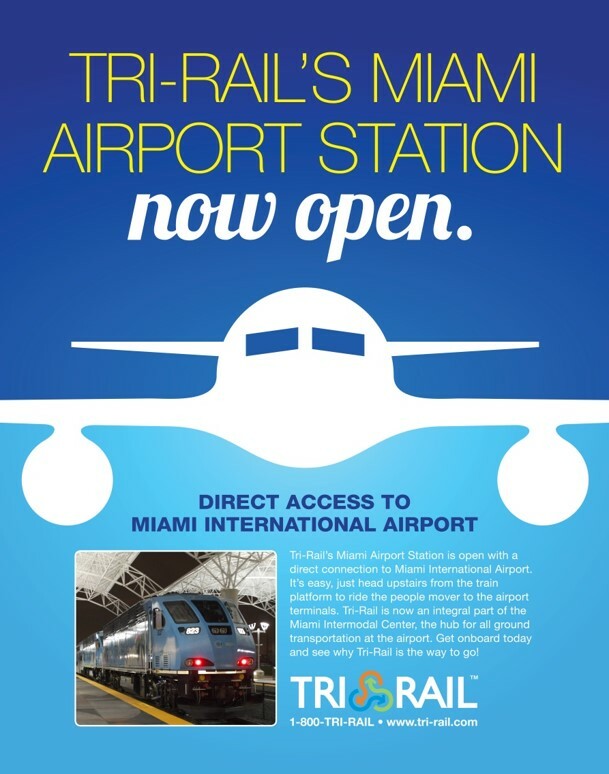 This poster, as part of a larger outreach program, informed Tri-Rail riders about the station reopening with a direct connection to Miami International Airport. 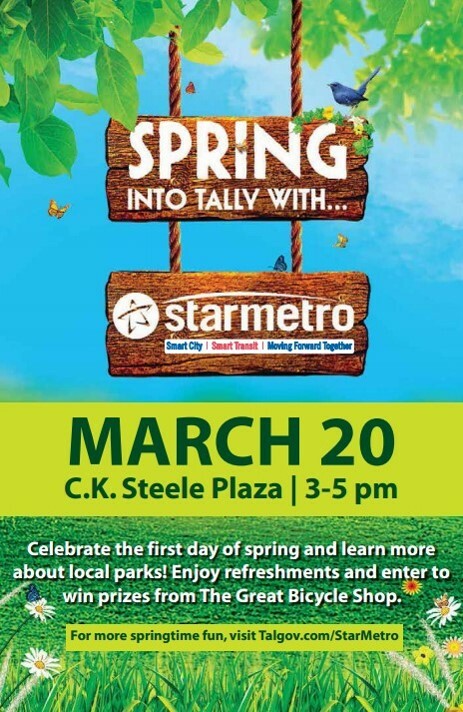 StarMetro wanted to get the word out about their upcoming spring event to help boost attendance. The system designed a creative and visually eye-catching promotional flyer that differed drastically from the system’s other print materials, leading to a total attendance of nearly 300 people and a highly successful event. 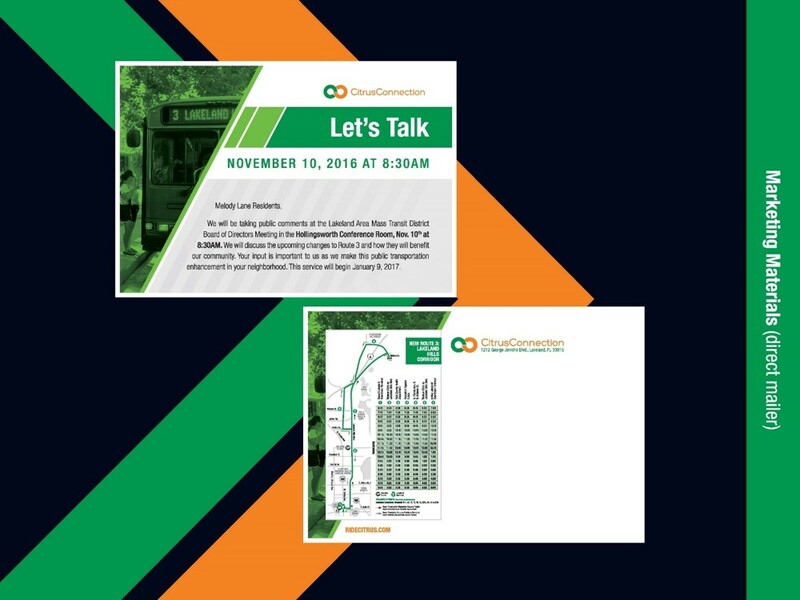 A general purpose, multi-targeted brochure was created to reinforce the benefits of CNG, explain why HART was transitioning to CNG, and provide the current fleet transition plan in a visually, appealing and relatable manner. It was also printed on all recyclable material which reinforced the message of sustainability. 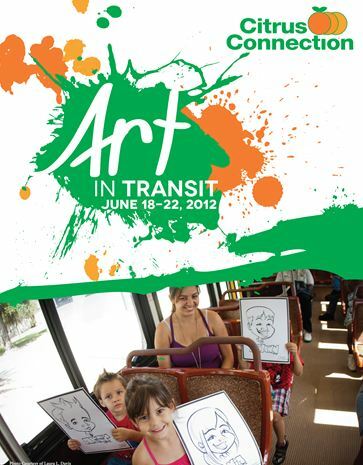 Art in Transit week is an annual event that brings awareness to the local artists in the community. The week of activities on the transit buses and at the terminal provide an opportunity for local artists to share their talents with riders who may not have an opportunity to be exposed to the artistic variety provided during the week’s event. This direct mail piece was designed to increase sales of TECO Line Streetcar 20-Ride passes and familiarize these residents with the closest location that sells this ‘special’. This ‘special’ pass, offered only to residents of the Special Assessment District is: 50 percent off regular price and only available at certain vendor locations along the line. The mailer was sent to 4,025 residents for arrival on May 10-13, 2013. ECAT created the Student Summer Wheels Pass to encourage all youth in Pensacola to take advantage of public transportation from Memorial Day until Labor Day 2013. The pass cost just $25. Rack cards were distributed to 250 churches, 7 high schools, 9 middle schools, and 18 community centers. Over the course of the campaign, ECAT gave a total of 732 rides to holders of the Student Summer Wheels Pass. Target Audience: Palm Tran Riders Project Cost: $0 Description: Palm Tran developed and implemented a new program to generate revenue by selling the space on farebox tickets to advertisers aiming to reach local transit riders. This unique opportunity was a new way that advertisers could reach this captive audience, as there were the only tickets available for purchase when passengers boarded the bus. Through Palm Tran’s bus advertising contractor, businesses could purchase the exclusive rights to 500,000 tickets that would last six months in the fareboxes. Tickets were sold in six month increments. The artwork on the tickets had to be approved by Palm Tran and display its logo in the bottom right corner for awareness and branding. The production and printing for a year’s worth of tickets typically cost Palm Tran $11,100 therefore the cost savings for Palm Tran was immediate. 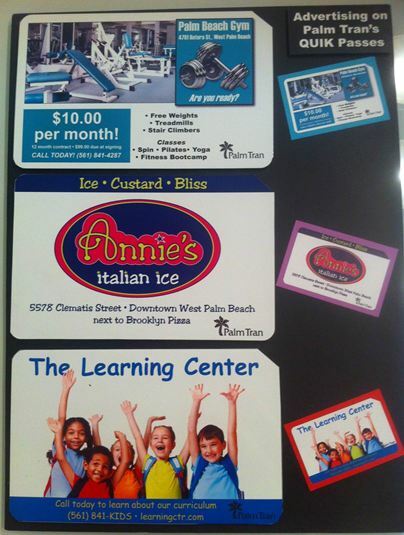 In addition, a 50/50 revenue split with the contractor produced additional funds for Palm Tran of $7,450. In total, the first year of this revenue-raising initiative resulted in a $18,550 Palm Tran profit due to this new program. Target Audience: General public, political community Project Cost: $1,650 (layout and printing) Description: Citrus Connection partnered with a local art group, Platform Art, who provided all the talent. The community enjoyed 5 days of various artists on buses and at the terminal. newspaper coverage of activities were available 4 out of the 5 days in the Ledger; coverage from our local Fox news; multiple coverage stories from the local PBS radio station; Bay News 9 also carried a story about Art in Transit. People who never rode the bus were on the buses to see the painting, hear the violin player, etc. The Mayor of Lakeland came to the terminal to speak with Fox News. More positive publicity from the partnership was received than from any other event held. This brochure was put together to commemorate the events for the community, while providing tangible proof the successful events for possible future grant funding. 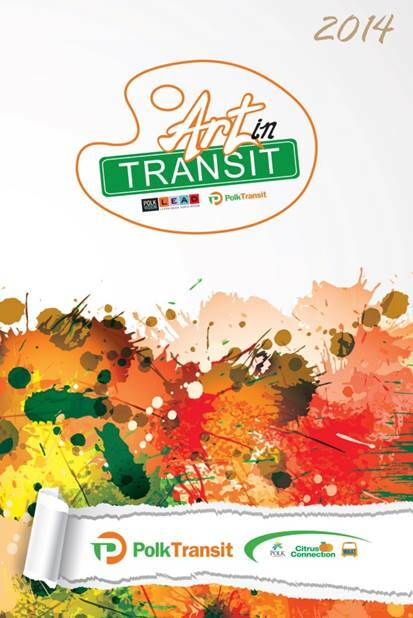 The “2nd Annual Art in Transit” week will definitely be held next year. 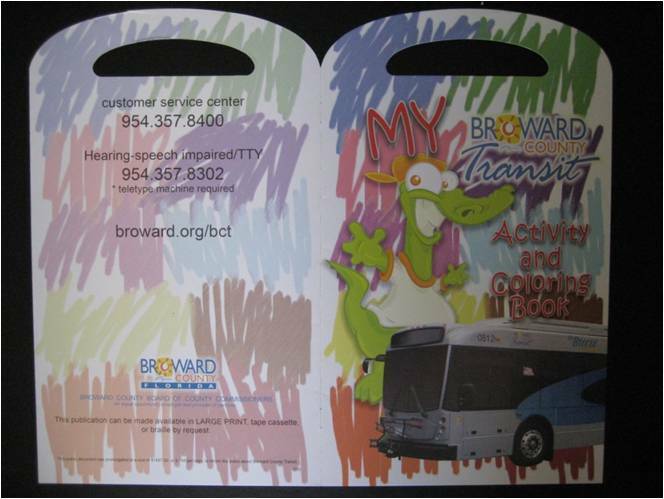 Target Audience: Bus riders, non-riders, stakeholders Project Cost: $3,500 Description: As a first-time print collateral of its kind for Broward County Transit, a conservative amount of 3,000 copies of the 2011 Calendar were printed and distributed at marketing outreach events, and to targeted passengers when they purchased a bus pass, to community organizations, the County Commission and Transit Advisory Board members and to transit stakeholders. Quantitative figures to measure effectiveness is attributed to its year-long shelf life that provides and enhances public awareness of our transit programs and services. Target Audience: Potential new riders, bicycle enthusiasts, current riders Project Cost: $5,000 Description: With the installation of new bicycle lockers at Tri-Rail’s stations, there was a need to promote this added benefit to current riders and educate the public about this new incentive. The objective of this campaign was to increase bicycle locker registrations, get more commuters onboard the train and promote the concept of riding a bicycle to the Tri-Rail station as another viable option to help commuters travel throughout the region. Tri-Rail’s bicycle locker campaign resulted in 29 new bicycle locker registrations over a 1-month time period, 6 million impressions via social media efforts, 633 registrations for the chance to win a Cannondale bicycle as part of the promotional campaign and participation from 39 bicycle stores and organizations, which helped to promote this to bicycle enthusiasts. Overall, this effort demonstrated the impact of utilizing local businesses to market the commuter rail system, and helped to draw attention to this new service, resulting in increased bicycle locker usage. 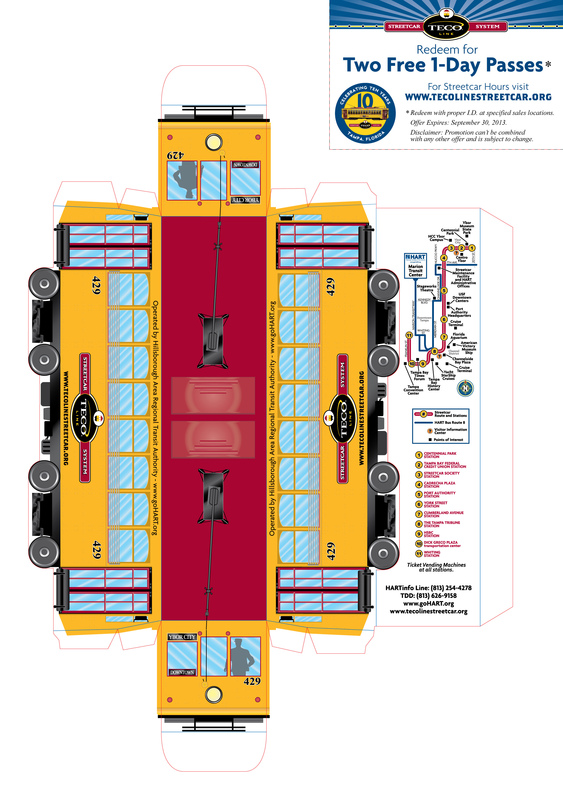 Target Audience: Handy Bus (paratransit) riders Project Cost: $612 Description: Citrus Connection recognized that collecting cash fares on its paratransit service was causing multiple problems for the operations and finance department. After much review, it was decided to eliminate cash and accept only bus passes. This mailer explained the change to riders and introduced an option to ride free and also a promotional pass offer. Prior to the mailer, an average of 128 passes were sold per month. Since the change, the average has been 346. Only between 5-8 riders have boarded without their pass per month and have had to be billed. The Finance department estimates the change saves about $7,000 annually in man hours counting and processing fare boxes. * Judge’s Favorite * Target Audience: Kids age 5 to 10 Project Cost: $1,497 Description: The print material was designed to educate kids in a fun way about BCT. Printed in July 2010, this piece was written and illustrated by BCT staff members and is a favorite among kids. Its eye catching cover has caught the eyes of kids which has in turn generated their parents interest in asking questions about transit when they stop at our booth at community outreach events. Usually these choice riders would just pass by. Overall, this piece has opened our direct communication with families as we have been able to successfully encourage them to try transit on the weekend to the beach, library, mall, etc., which most have done and told us about their experience. 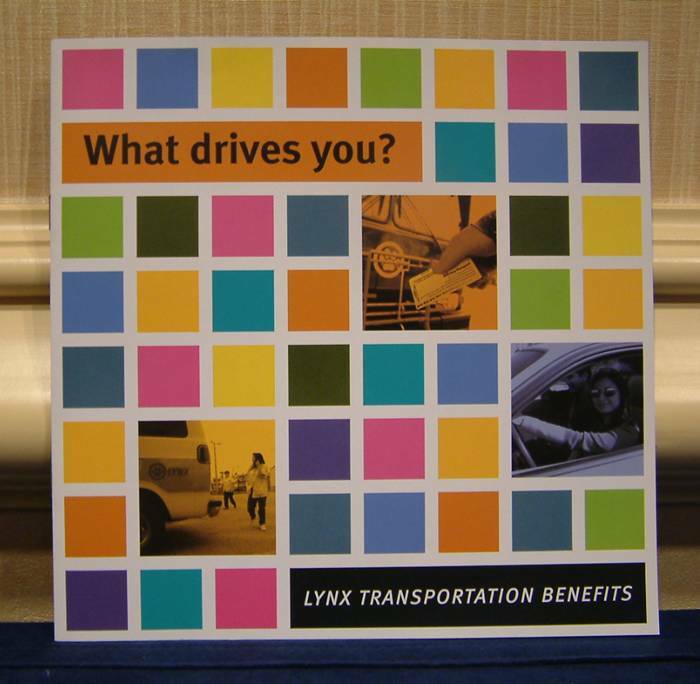 Target Audience: Stakeholders, Business, and Politicians Project Cost: $8,100 Description: Delivering Options, JTA’s latest annual report, reflected back on past accomplishments and looked forward to delivering transportation options for Northeast Florida residents. From providing a brief history of JTA to describing a future filled with thriving transit-oriented developments and a regional transportation center constructed to house the region’s Transportation Management Center and other transit-related operations, the report was shared with local business, community, and government leaders as well as supporters and friends of JTA. Target Audience: Stakeholders, Elected Officials, Riders Project Cost: $1,500 for printing and shipping Description: As part of the strategy for continued correspondence with elected officials and key stakeholders, the Bay Town Trolley obtained local funding for extended and Saturday service for the 1st time in its 12-year history. 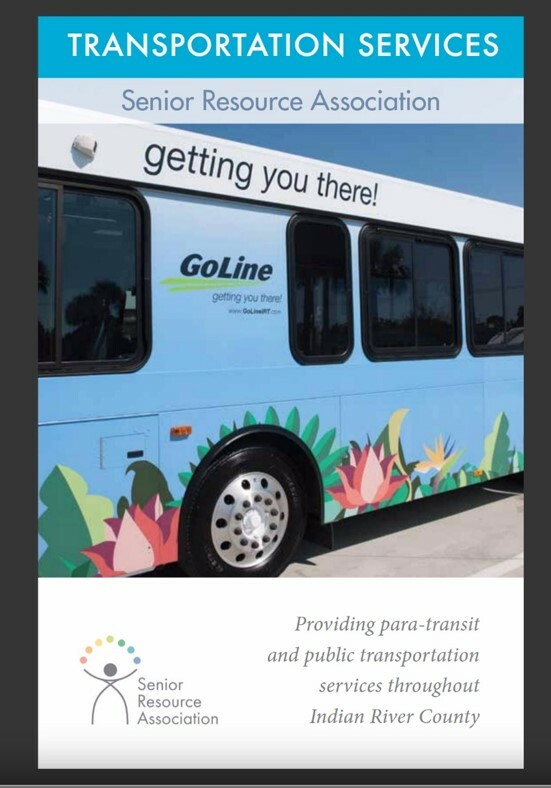 Target Audience: Community Leaders, Politicians and the general public Project Cost: Design – $13,425; Printing – $11,110 Description: JTA has met the challenge to move the region forward by expanding the mobility options in the area. Most stakeholders do not understand the vision and how all the modes are linked to make one effective system. The brochure needs to sell the vision and show how the Authority is planning for regional mobility. 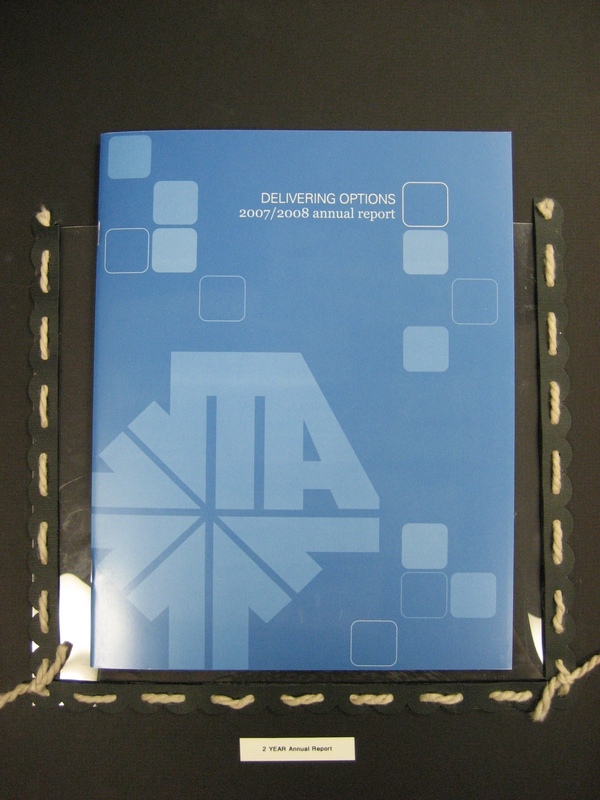 This was the first ever attempt to place the vision of the Authority into one document for public distribution. The objective was to communicate the Authority’s vision, show how that vision fits in the larger plans for the region and begin to educate the public on the value of a multi-modal transportation system. Community Leaders, politicians, and regional citizens are beginning to embrace the future JTA envisions. This is evidenced by the change in flavor of discussions in the public and in the media where one mode is not being defended against another, but words like system, vision, long range planning are beginning to emerge. Target Audience: Panama City Residents and Tourists Project Cost: $3,500 Description: Trolley officials wanted to create a theme that called both tourists and residents into action. The new creative concept for this specific route became “Flip Flop Aboard the Pier Park Express” with the tagline, “Bay Town Trolley’s new Weekend Beach Route.” This theme linked all the pertinent elements as it tied flip flops in with the beach atmosphere, gave a name to the route, “The Pier Park Express,” and told the public that this route is Bay Town Trolley’s new weekend beach route. 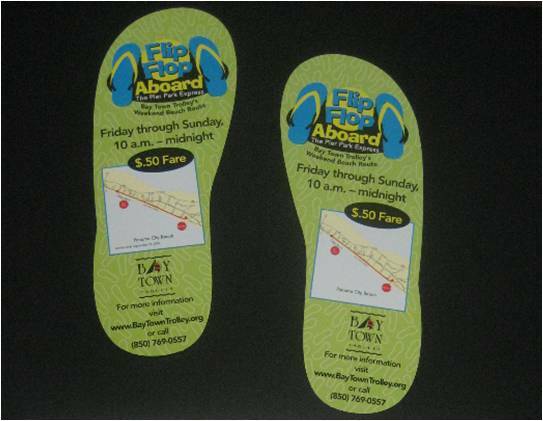 With the message developed, trolley officials decided that the best way to package the message and route info was to develop a brochure in the shape of a flip flop. 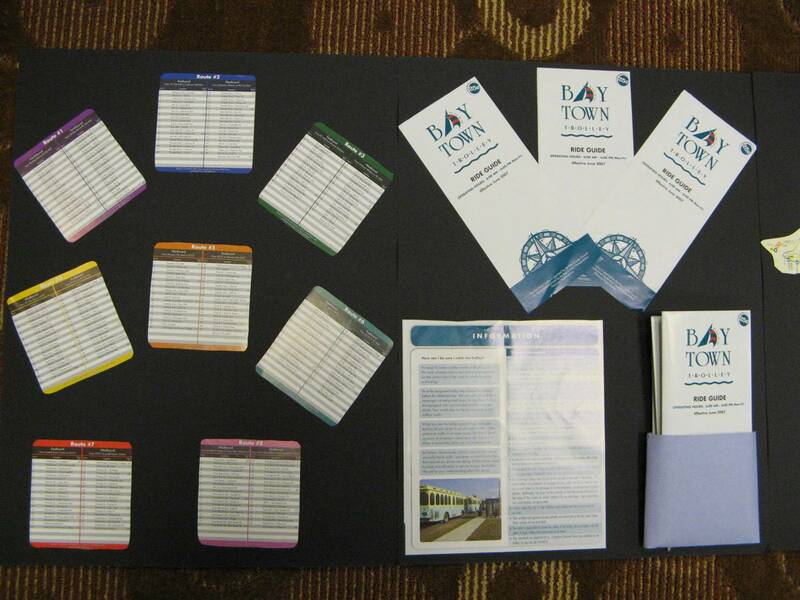 This 4″ x 9″ brochure incorporated the theme, route map and schedule, fares and points of interest. After the production of the 50,000 brochures, trolley officials distributed them to hotels along the beach and at prominent beach attractions. Results: Prior to the start of the campaign, there were 2,033 rides taken over the course of a two-month period. After the implementation of the campaign, 2,614 rides were taken. This reflects a 28 percent increase in just one month. Target Audience: Tourists visiting the Greater Miami area and its beaches Project Cost: $12,000 Description: Each year, more than 10 million people visit Greater Miami and its beaches. Miami-Dade Transit wanted to provide these visitiors with an easy and convenient way for them to get around without having the hassle of worrying about carrying change or having to purchase an entire monthly pass. 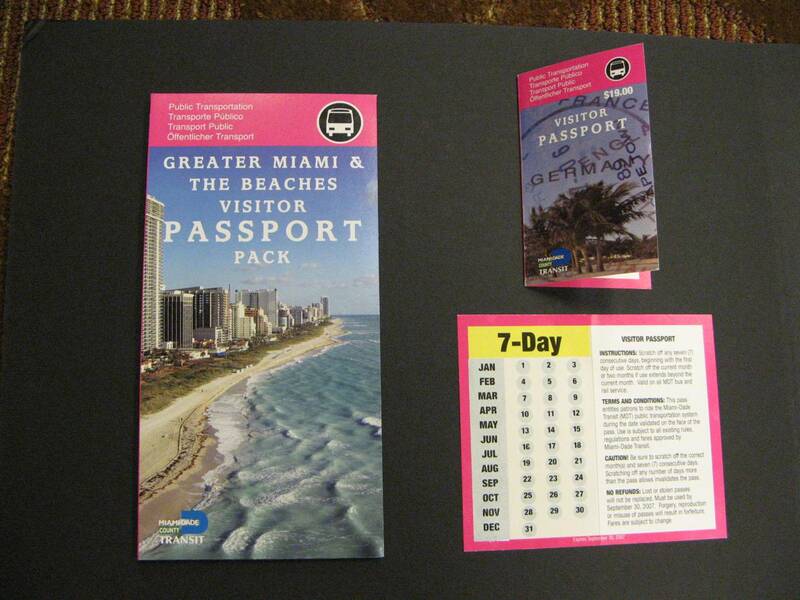 Thus, the Visitor Passport allows visitors to travel throughout Miami-Dade County, only for $19 – less than a full tank of gas. A weekly, scratch-off pass allows tourists to choose which days they want to use for unlimited rides on transit to visit the most popular tourist spots in the Greater Miami area. 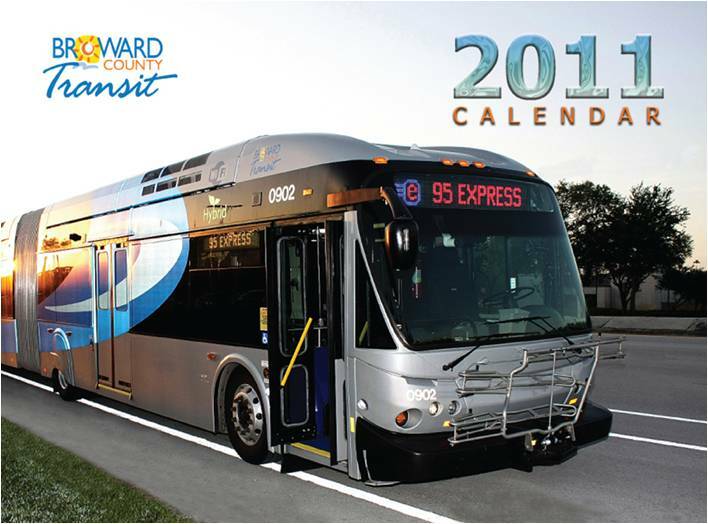 The pass comes inside an attractive and colorful kit that includes a comprehensive transit map that features enlarged areas of Miami Beach and downtown Miami. This map also gives the addresses and contact information of popular shopping malls, attractions, museums, and art and cultural centers. It is a complete guide and ride – all for less than what it would cost to take a tour, or rent a car. Although the pass just launched at the end of May, sales of the pass have exceeded MDT’s expectations. Description: With the implementation of new ride guides, ridership continues to grow. Bay Town Trolley “rolled out” the new guides in June 2007 and since then ridership has reached 263,835, a 28.5% increase compared to last year! 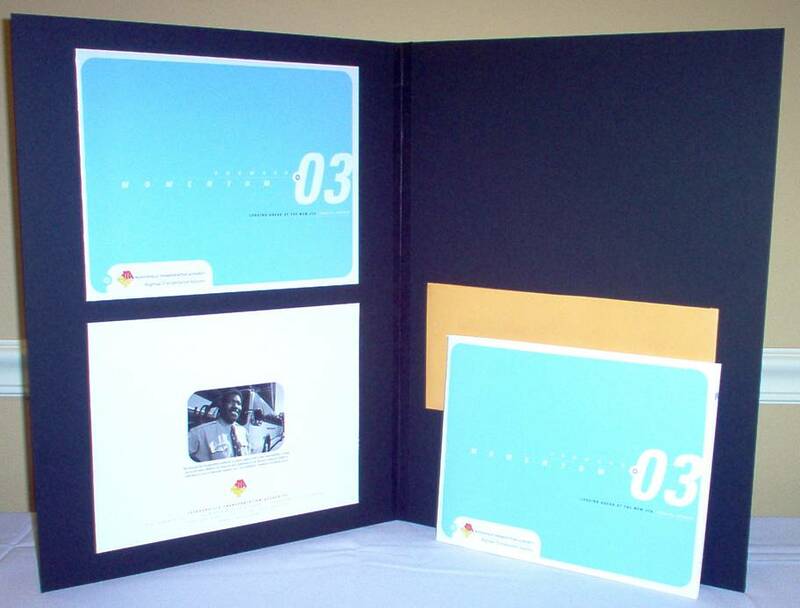 Target Audience: City, County, and State Elected Officials, Chambers, Key Media, Partner Agencies, Business Leaders, Leadership Organizations, Planning Organizations Project Cost: $22,400 Description: This was the 1st ever Annual Report publication produced by JTA. This Annual Report provided the target audience with JTA’s new and improved business image and enhanced JTA’s chances for future funding opportunities. Target Audience: Current and Prospective Customers Project Cost: $3,258 Description: With the installation of new fareboxes with magnetic swipe cards, this collateral piece was designed to introduce the new M Card line of bus passes to existing riders and prospective riders. Comparing one typical month between 2004 and 2005, revenue from farebox collections increased 7%. 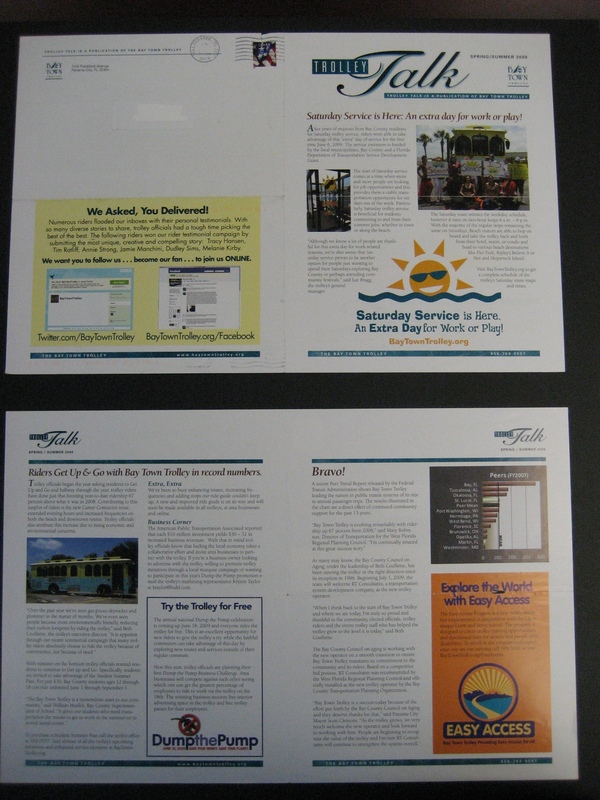 The brochure was designed to hang on the handrails in the bus for exisiting customers. 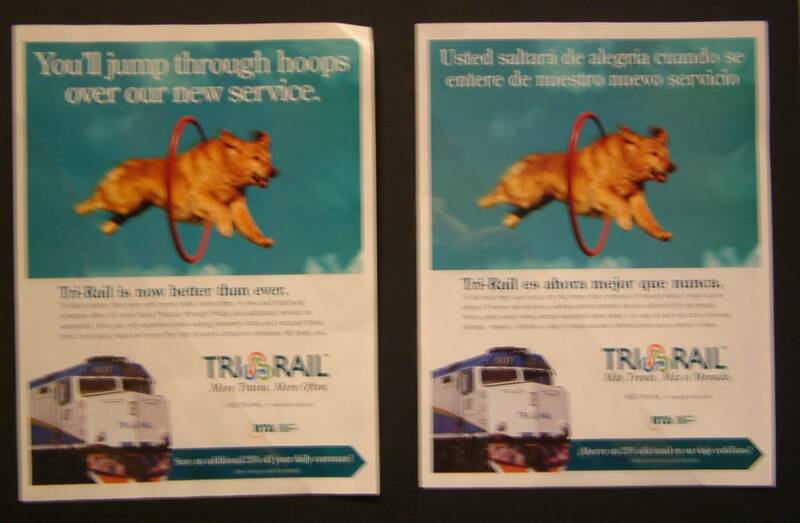 A trimmed down version was mailed to prospective customers upon request for any transit information. Four separate covers were used to entice riders to read the information more than once.